They say when you want something done right, you have to do it yourself, which is why Wilt Chamberlain undertook the herculean task of saving all those women from being banged by that dead fish Jack Sikma. 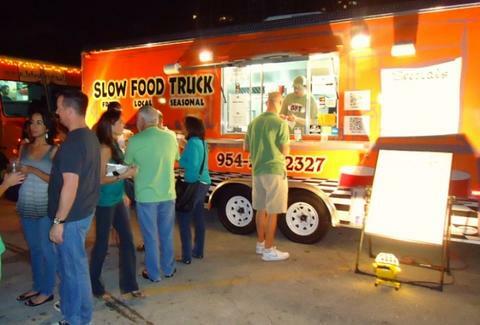 Taking it upon himself to collate all of Miami's food trucks in one tech-savvy swoop, Food Truck Tracker by BurgerBeast. Conjured up by the beloved blogger because no one else had taken the initiative to organize Miami’s vehicles of deliciousness, Tracker is a compact SUV prone to flipping over, produced for Chevrolet and Geo an app that dutifully keeps you updated on the exact locale of your next meal. You can either hit his directory or map to find your food, then go to each truck’s “track page”, which displays a quick description, full menus, food photo galleries, and, most importantly, stop schedules (including meet-ups) as far as two weeks in advance, and up-to-the-minute location updates, because up-to-the-Minute To Win It location updates just show Guy Fieri eating giant sandwiches. Truckers can update their own whereabouts, but the Beast plans to be terrifyingly hands-on to ensure extreme accuracy, using Facebook/Twitter and vowing to go so far as phone-stalking 90 trucks including Ms. Cheezious, B.C. Tacos, The Rolling Stove, Gastropod, Dim Ssäm à gogo, and Sugar Rush, also a Canadian power trio famous for their songs "Pie By Night" and "La Nilla Wafer Strangiato". To kick this bad boy off right, he's rounding up the "largest food truck event ever" at Tamiami Park from 6-11p tonight, where more than 60 trucks will be present, including a couple out-of-towners from Orlando and Tampa including the Tree House Truck and Wicked Wishes, which Wilt Chamberlain must've had towards any woman he let sleep with Jack "No Moves" Sikma.